Russia didn’t trigger the Gilets Jaunes. But Putin and the far right want to see Paris burn and Europe weakened and divided, so they jumped at the chance to contaminate and manipulate them. Macron’s been on a tour of East Africa, specifically Djibouti, Ethiopia and Kenya. He’s not there to make the world a better place, but because economies in Africa are growing fast, in fact six of the top ten fastest growing economies in the world are there. One of the agreements Macron made on his trip was to build a trainline in Nairobi. If you had any doubt that colonial instincts run deep, then that blast from the past should get rid of it. Nothing stirs Europe’s colonial powers like the thought of riches up for grabs in Africa, well apart from the thought that someone else might grab them first. It was much easier to get away with smash and grab forays into Africa when there were no competitors, but there’s a new power in town that goes by the name of China. France doesn’t like the idea of China getting involved in a part of the world where it has had a free run for, well centuries really, and Macron travelled with dire warnings about letting Beijing in the front door. Problem is, France already kicked the front door off its hinges, stole the sofa and made the people living in the house cook dinner. Historically speaking of course. Fouquet studied at the Lycée Louis le Grand in Paris. In 1681 he entered the order of the Jesuits. Four years later he taught mathematics. In 1693 he became a priest and in the following year he decided he wanted to volunteer in Asia. In 1699 he arrived in Amoy. Until 1711 he worked in Fujian and Jiangxi, then he was invited to Peking, to teach math and astronomy. He left hurriedly in 1720 with 1200 manuscripts. In Canton he had to wait one year for a French ship. He returned to Europe in 1722. Fouquet had taken with him a Chinese man, named Hu, who liked Paris and got lost in Quartier Latin. Hu preached for a while in the Chinese language in front of Saint-Paul-Saint-Louis, attracting a crowd. Fouquet decided to go to Rome and planned to take Hu with him; Hu did not like to travel by stagecoach, got furious and preferred to go by foot. When Fouquet set off by himself, Hu was taken with a lettre de cachet to an asylum in Charenton. He published the Tabula Chronologica Historiæ Sinicæ ("Chronological table of Chinese History"). Foucquet, a Figurist, endeavoured to show that the Book of changes (I Ching) anticipated the coming of Jesus Christ. Before the Yellow Vests, there was the French Revolution of the white underpants... This from a Vogue magazine circa 2016. Life is weird... Read from top. Video. Macron to children: "people put a yellow vest to break everything, they do not care that things are better"
At first, the "yellow vests" were people who "could not manage to make ends meet" and said "we do not live well enough". "And then, we must take the car to work, it becomes more and more expensive and we have many constraints and (...) we are far from the big cities," said the President of the Republic to his young audience. "That's why there are many French and French who said: we agree with" yellow vests, "said the head of state. To these people, he added, the president "wants to provide an answer". "Yellow vests that I do not like"
"We tried to bring first answers in December, doing things for what is called their purchasing power," he said at the end of an exchange that lasted about two hours. Then there was a second phase of the movement, he continued. 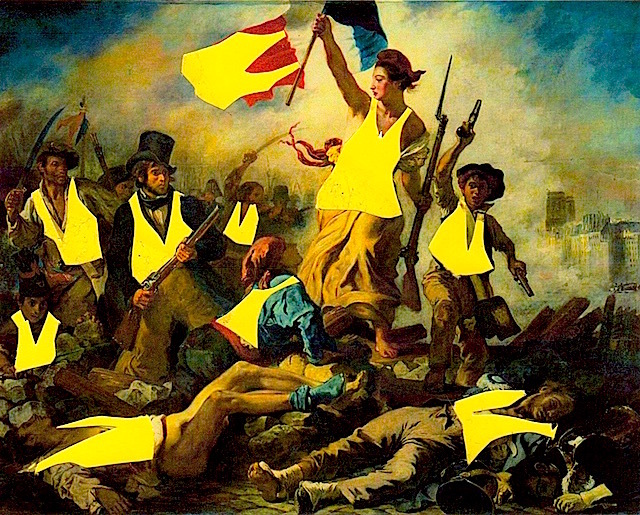 Protesters "put on a yellow vest to break everything". They "do not care that it's better, they just want it to be their rule that imposes on others". "It's the ultras as they say (...) And they are the yellow vests that I do not like"
In Paris, protesters gathered in two locations, forming a joint column and marched towards towards Trocadéro square. Emmanuel Macron is known as an advocate of combating pollution globally, but did he succeed in doing so in France? RT visited one of Europe’s largest industrial zones, where noxious fumes are putting people’s lives at risk. Fos-sur-Mer looks like an idyllic seaside city in southern France, but it accommodates a sizeable port and industrial facilities, including oil refineries, chemical factories and steel plants. Day and night, all of these are releasing toxic fumes into the air, RT’s Charlotte Dubenskij reported. Residents claim that these compounds are having a devastating effect on their health, with the number of cancer, diabetes and asthma patients higher than the national average. “The main problem comes from the industrial port area which emits ultrafine particles that get into our lungs and blood streams,” said Daniel Moutet, president of a local environmental group. Moutet, who has diabetes, explained that the high rate of diseases could have been lower if noxious waste was disposed of properly by Fos-sur-Mer factories. “Just 50km from here, none of this is happening, so this is a local problem,” he added. Local industries maintain that they meet the highest environmental standards possible. The Esso refinery, for instance, which produces seven million tons of petroleum products a year, said it halved its sulfur emissions over the past 10 years while reducing nitrogen oxide emissions by two-thirds, according to AFP.